Children and toys. Toys and messes. Those squeaky little bits and pieces have a knack for spreading and multiplying, taking over your kitchen table, your bed, even the WC. Storing toys is clearly not child's play. However, a well-managed playroom is attainable with these successfully tested techniques and tips from the Mamas. This one is tedious, especially for first-timers, but it is easily the best-kept secret of super-organised playrooms. Prioritise toys that are most played with, or simply divide the collection into two halves, and pack away one batch to someplace where it is easy to retrieve it. Let your child play with one set of toys for a month or more and then swap it with the other batch. The toys stay fresh and keep the children's interest, while dividing your clean-up time by half. If your child likes to follow you around, it is easier to manage small areas in each room. This is especially handy if your house is on multiple levels. For example, I keep all the board games in our living room because that is where we usually play with them, while books and craft material are stored out in our enclosed balcony space. Distribute them around the house and it looks less cluttered. Printed and mono-coloured foldable cardboard boxes from Hema are reasonably priced, multi-purpose and easy to label. Children can bin the toys themselves. Put on the cover and the mess is hidden. Another plus is that these boxes will come in very handy if you move house or country - the delights of an expat life! Boxes with wheels make it easy to take toys in and out of rooms, especially if you live on one level. Ikea has several storage options with wheels underneath. Canvas bags, rucksacks and padded containers are super handy and easy to store. Web shops like Kids Wanna Haves, The Great Little Trading Company and The Toy Storage Company have some interesting designs to offer and they deliver to Amsterdam. For the crafty mamas and papas, nothing spells creativity like hacking a mundane living room furniture piece into a clever storage unit. For example, Ikea’s Trofast units can easily double up as train and Lego tables, sitting benches, or as stairs for cabin beds. They can even be converted into a handmade modular kitchen or a mini wardrobe if are up to the task. Re-imagining storage ideas from an idle piece of furniture lying around your house is not only budget-friendly, but children can be a part of the process too. A project like this one promises some great bonding time and a wonderful new storage unit with a story of its own. Tempting enough? While doing up my daughter's room last summer, I decided to add some vintage charm to her room. The furniture stores at the Albert Cuyp street market are a delight. I scoured the market on a balmy Saturday and brought home a pretty yellow chest that holds some of her toys now. Loods5 in Zaandam and Woonexpress at Villa Arena in Zuid-Oost offer storage concepts that can add a whole new character to the room. There are trunks with rugged overtones and decorative storage containers with industrial metal scraps. For boxes with cute prints and motifs, check out Hebbes in Speelgoed on the Harlemmerdijk. Storing toys need not break your bank. The never ending collection of pompoms, googly eyes, washi tapes and crayons are super easy to store in flower pots. Pick up some colourful planting tins or terra cotta pots from Flying Tiger or Praxis Tuincentrum and pep up your child’s worktable. Shadow boxes can double up as quirky art installations. They are an easy way to store small toys, figurines and sculptures. Get your child involved and let them select a spot for each toy. Scout them out at Xenos or Blokker. Fruit crates make for gorgeous bookshelves and can hold the numerous puzzle boxes lying scattered in the house. Visit the Farmer's Market at Amstelveen on Fridays or Albert Cuyp street market at closing time and the chances are you can get your hands on decent wooden crates for free! Wash them and splash on some colours and you will get uber-cool storage bins. There's no pain like stepping on a brightly coloured block of one-that-shall-not-be-named. Prepare a counter-attack with these cunning ideas. If there is a huge collection of Lego taking over your house and your sanity, devilishly multiplying each month, Swoop Bags are angels in disguise. Available on Amazon sites, these bags come in several sizes and cheerful colours. Crafty mamas and papas can hand-make them too! Spread them out as a circular play mat while your child builds cars and castles and precious what-nots, and swoop up the blocks when playtime is over - remembering to take the child out first! 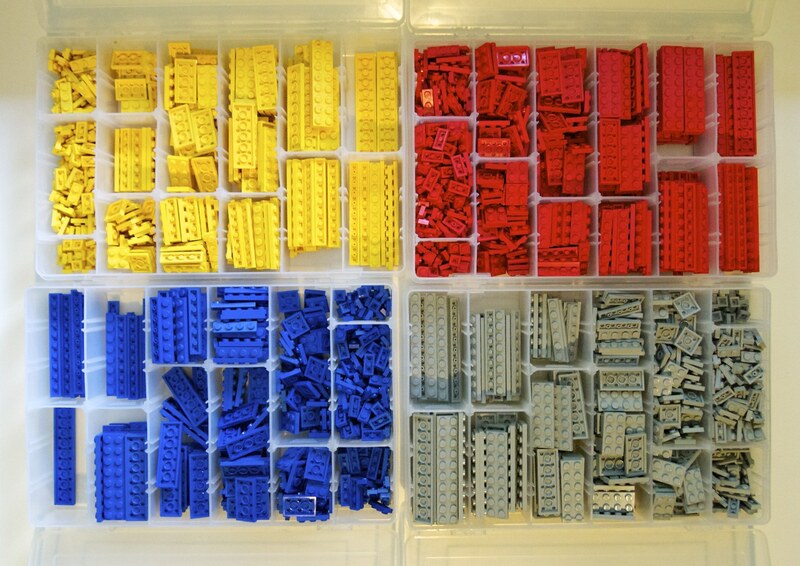 Before your OCD heart breaks at the sight of another giant Lego pile, stock up on zip-lock bags. These can come in very handy for sorting out the smaller parts. Most supermarket stores keep a variety of them, but the ones from Ikea seem particularly durable. Bag up the figures and accessories, or sort pieces according to colour, and then keep them together in an under-bed storage box. Investing in a big tool box could be a fun idea too if you love sorting the blocks as much as your child loves playing with them. Dedicate each compartment for a set of Lego or a different colour and get your little one to help. Investing in a good shelving unit can work wonders too. Muji offers a variety of them. Their selection of document drawers can come in useful too. Small in size as they cater to A4 size sheets, they can sit pretty on a table and hold plenty. Ikea fits the bill perfectly in this department. The internet is teeming with Ikea hacks offering easy steps to convert their regular ware into adorable and well-functioning handmade units for easy Lego storage. Or look up second-hand websites, such as Marktplaats, and you’ll be surprised by the storage options available. A large wooden crate, used for shipping artwork could turn out to be your perfect storage companion. Often, space can be a constraint in Amsterdam homes. In that case, why not invest a tiny sum in a shoe hanger? It can hold the blocks within its different compartments and can be hidden away in a closet or hung from a door. During my child’s first year at school, I've been guilty of mailing tons of my little one’s art to grandparents because I didn't have the heart to bin them. They are fragile tokens of your child’s youth but you can only deal with so many drawings, paintings, sketches and sculptures at one time. It can be overwhelming when the school sends home a deluge of artwork by your pint-sized Picasso. Sort and save only the most worthy artwork that your little one rolls out each week. It is best to invest in a pretty-looking storage chest. Most trunks and vintage chests have a decent capacity that will allow you to keep adding to the collection. There are several apps that can store digital images of your child's works. Take a picture and upload. Share it with your family and friends and have them write their comments. Keepy, Canvsly, Artkive and Art My Kid Made are some friendly apps worth installing. Saving them in beautifully designed photo books can be worth the effort. Make the pages with pictures of your child’s artwork and jot down some anecdotes or your child’s description of that art piece. Years later, it can double up as a lovely gift for your child. Save up some colourful bits to use as wrapping paper to add a personal touch to gifts. Convert one corner of your child's room into an art wall and display their best works from the month. String across a clothesline or hang a plain whiteboard. These are simple to use and the artwork can be rotated. This article has been compiled from the recommendations of our members on the Amsterdam Mamas Facebook group. Meher Fatma is a full-time mom and a freelance writer. Passionate about DIY projects, she loves putting her crafty ideas to use at Button Balloons, an online party shop that she co-owns.